The holidays are here, and along with them are the family gatherings and office parties featuring a wide variety of foods and desserts that will tend to be high in fat, sugar, and sodium. For people with diabetes, attending these soirées without having a plan in place could lead to overindulging in these foods that aren’t kind to blood sugar control or A1c levels. One solution is to prepare diabetes-friendly entrées, side dishes, and desserts they can eat at home and/or bring to holiday parties. In this month’s E-News Exclusive, Today’s Dietitian (TD) features two side salads and two desserts suggested for those with type 2 diabetes. After reading the article, visit TD’s website at www.TodaysDietitian.com to read the digital edition of the November issue, which includes articles on RDs’ favorite holiday recipes, children and type 2 diabetes, choline’s important role in overall health, and the latest trends in frozen desserts. And remember to check out RDLounge.com, where you can read and comment on blogs written by RDs for RDs on timely topics. We’re welcoming new guest bloggers, so if you’re interested in writing, please contact me at the e-mail above. Ah, the holidays are upon us. Don’t you love ’em? I often find myself humming away to plenty a holiday tune. While it can feel like the most wonderful time of the year, the holidays often are overflowing with foods high in salt, sugar, and fat, which can make us feel, well, not so wonderful. Whether it’s a family gathering, a friend’s party, or an office celebration that includes lots of food, cakes, and cookies, the last few months of the year can be a challenge to even the most disciplined, healthful eater. Clients with type 2 diabetes will need to take special care to minimize pitfalls during this time of year amid the many unhealthful foods that will cross their paths. To ensure the holidays are fun, enjoyable, and stress-free, RDs can help clients with type 2 diabetes develop a strategy and plan ahead so they can avoid eating too many unhealthful foods that aren’t kind to keeping blood sugar and A1c levels under control. To get a head start on a more healthful holiday season, I’m sharing my favorite recipes that are delicious, easy to make, and diabetes friendly. Federal, state, and local governments all have roles to play in protecting health. Federal and state governments, however, can alter or hinder state and local activity through a legal mechanism called preemption—when a higher level of government blocks the action of a lower level of government. An increase in state preemption of local food policies led a research team to assess whether preemption of taxes on sugar-sweetened beverages (SSBs) by the federal government would likely be based on Congress’ historical rationales for preempting taxes. SSBs are associated with obesity, diabetes, stroke, and heart disease. As of June 2017, eight US cities have enacted SSB taxes aimed at reducing consumption, and several other states and municipalities are considering them. Excise taxes can reduce consumption, improve health, and raise revenue for budget-constrained governments. The research team, from New York University’s College of Global Public Health and the Friedman School of Nutrition Science and Policy at Tufts, reviewed legislative histories of federal bills and laws that had a central and express purpose of preempting state taxes. The goal was to determine whether historical rationales for preempting taxes applied in the case of SSB taxes. The American Council on Science and Health explains the volatile nature of nutrition research, reporting, and recommendations. In spite of nutrition’s importance for disease prevention, most US medical schools don’t require medical students to learn basic nutrition theory, The University of North Carolina at Chapel Hill reports. Learn about postbariatric body contouring surgery in this month’s issue of Today’s Dietitian. Read the CPE Monthly article, take the 10-question online test at CE.TodaysDietitian.com, and earn two CEUs! We are pleased to partner with Becky Dorner & Associates, Inc., your resource for healthy aging and nutrition care of older adults. Enter here to access the Becky Dorner & Associates, Inc. Partner Page. From here, you can explore all the resources on the BDA website. Use the code TDFRIEND on your online orders and receive 10% off your order automatically! Buy 2 Courses, Get 1 FREE! * Offers cannot be combined with any other promotion. Private Practice — What Are You Waiting For? Join us for our 5th annual continuing education and networking event for dietitians and nutrition professionals in Austin, Texas, May 20–23, 2018, at the Hyatt Regency! 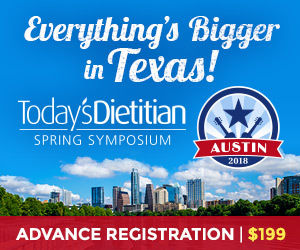 Presented by some of the foremost experts in dietetics and nutrition, our diverse program can earn professionals 15 CEUs or more on session and workshop topics including Cancer, GMOs, Sports Nutrition, Lab Assessment, Digestive Diseases, Food Sensitivities & Allergies, Gut Microbiome, Culinary, Branding, Intuitive Eating, Mindfulness, and more. Visit TodaysDietitian.com/SS18 with the presenter lineup coming soon! Advance registration only $199 through November 30! REGISTER NOW! Registration does not include accommodations or travel to and from Austin, TX. For those who cannot afford the registration rate, a limited number of scholarships are available for complimentary registration. Coming up in our December issue is our Annual Resource Guide. E-mail a sales representative to be part of this unique advertising opportunity.